The Old Bridge is so called to distinguish it from the new one seen in the background, a short distance up-river. The new one carries the A82 from Glasgow to points North, including Loch Lomond. The old one was built by John Brown of Dumbarton in 1765, commissioned by the Duke of Argyle. His Lordship wanted to facilitate his journeying between Argle and Glasgow. The Bridge was built on the site of a ferry crossing. Today the traffic crossing ‘The Old Bridge’ is light, with only a few cars joining the local buses, unlike the constantly busy new crossing seen here a little upriver. The Leven Nearing Its End. 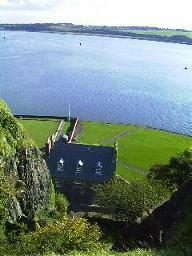 It shares the landscape with Dumbarton Rock as it flows around that ancient pile before joining the Firth. I previously posted the beginning of the River Leven. Now we’ll see its incredibly beautiful end and learn the fascinating history of Dumbarton Rock and Castle whose origins go back thousands of years. 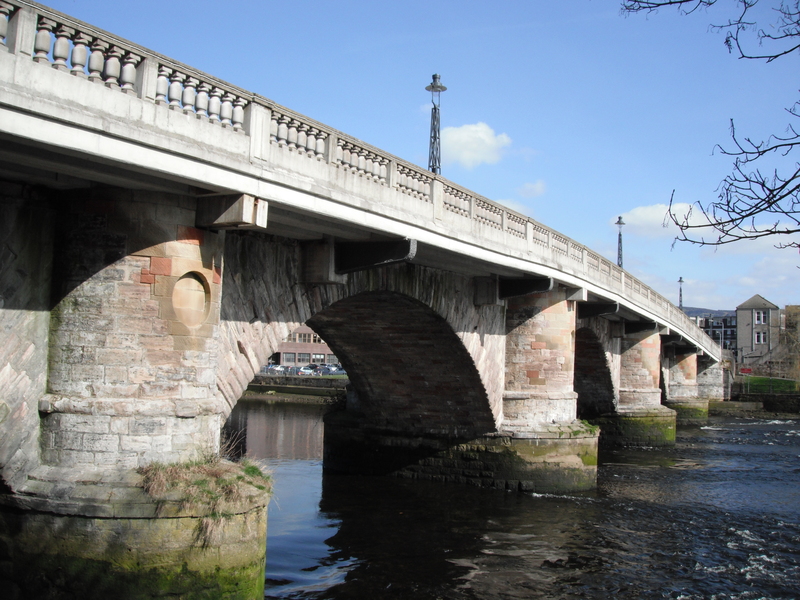 First, though, some images of the river as it passes through the center of Dumbarton. This video show the river flowing under The Old Bridge shortly before it passes Dumbarton Rock which you can see in the background. Once past the Rock, it joins the Firth of Clyde. River Leven’s end. I find Dumbarton Rock fascinating. It is a plug of bassalt, volcanic rock, and was first mentioned by St. Patrick in 450 A.D. A fortress and centre of the ancient kngdom of Strathclyde, it has a long and colourful history. I will supply a link to an excellent source of a detailed historical and close-up pictorial account. Briefly, it has twin peaks, White Tower Crag and The Beak. It served as a fortress for at least 1600 years, guarding not just Dumbarton, but access by water to Glasgow. Nothing remains of the earliest Dark Ages buildings, but some Medieval structures have survived. Along with these is the latest, ‘The Governor’s House’, a.k.a. ‘Dumbarton Castle’, still in good condition, and ‘new’ by historical standards – 17th century. 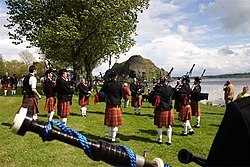 This photo is of the 2005 Scottish Pipe Band Contest. This year, 2011, was a different matter. High winds and torrential rain, with us for almost all of the month of May, made for a very different experience for both band members and specators. 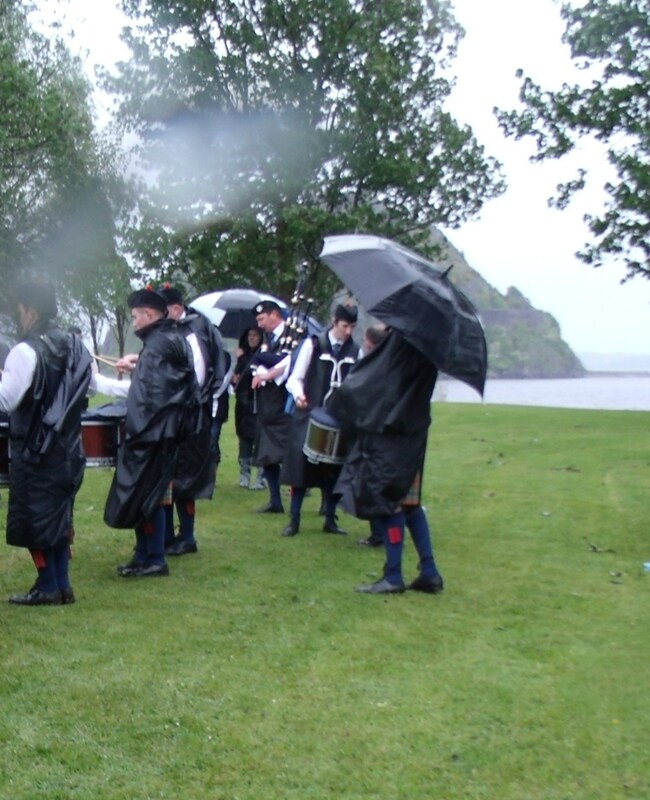 Below is a telling photo and a video that lets us hear the excellent playing of the Central Scotland Police Band, weather notwithstanding. The festive air of the occasion comes accross also. 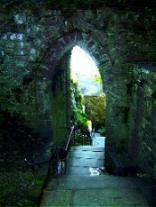 The Portcullis Arch on Dumbarton Rock dates back to the 14th century. ‘Rampant Scotland’ has a wonderfully informative site with an in-depth history of Dumbarton Castle and many great photos. Here are a couple of samples to whet your appetite. A link to their web site is provided below. From sea level, looking up at the Rock, it does not look as if there is room for any flat grassland, but this photo shows how deceptive that perspective is. From not far away, Dumbarton Rock looks barren and forbidding. For centuries, though, it was a hive of activity and this picture shows just how attractive it really is. The long and detailed history has been beautifully documented and illustrated by someone other than me. I’ve posted the link below which will take the reader to this source. I’d give the highlights but feel that the privilege should go to the author and researcher of all that wonderful information. Click on the link below to access the site.